It had come time to replace ETRL's dilapidated renewable energy system with a new system. The ideal system, currently manufactured, is the Lakota, from True North Power, together with a new solar panel. Thank you to everyone who helped make the Urban Turbine a reality on the roof of our Existential Technologies Research Laboratory. Special thanks to David Cooke of True North Power, and to everyone else here yesterday. It was great to see such a tremendous show of support for rooftop wind energy. Pictures of the urban windmill-raising are in http://wearcam.org/urbine/ and there will be more pictures of the finished project soon. Canada's first inner city "Urbine"
Some work remains to be done before we turn off the brakes (the innovative Lakota design uses dynamic braking into useful loads like Air Heaters, Water Heater Elements, etc., and is always producing power as long as there is wind), and our digifest Opening Keynote and events (audience 10,000 people) are only 1 week away!!! If any of you would like to have a part in our digifest presentation, feel free to let me know. I have drafted up research proposals to POWEROHM and IPC Resistors, and also Isaac and his brother are doing ongoing research on energy storage solutions. We hope this will be an important step forward for our research agenda in Urban Renewables. We are also working toward reducing our energy consumption through our new designs for light fixtures and illumination engineering, ranging from things as simple as new kinds of light bulbs and our "green-is-white" illumination designs, to ideas as far-out as our brainwave-sensing headbands that dim lights down automatically when a person is in a mental state where less light is desired (our research papers recently submitted to ACM Multimedia). Lots remains to be done in time for digifest next week, so we look forward to some preliminary data collection, and to the design of the data logger for the anemometer as well as the turbine itself. 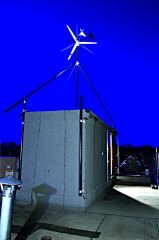 Also, we still have sun studies and wind studies that need to be completed, and we still need a team to put up the weatherproof rooftop webcam that will allow us all to continue to monitor the wind turbine with our new computer vision algorithm for turns-counting. Combining the new wind turbine with a larger solar panel, and a better energy storage and distribution system, we'll be all the more ready for the next power outage. Latest news, DIAMOND CLAD RENEWABLE ENERGY has just brought the batteries in.